Each quarter, Director of Aldrich Wealth Nicole Rice and Chief Investment Office Darin Richards provide market commentary and make projections for the upcoming quarter. 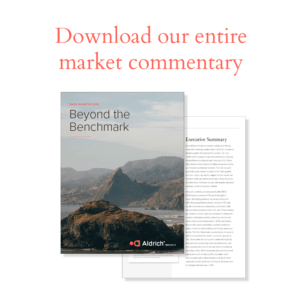 This conversation is accompanied by a deeper dive into market performance and outlook as well as featured articles on popular topics such as retirement planning and changes in interest rates. Despite robust earnings and a healthy economic backdrop, 2018 turned out to be the most challenging year for investors in a decade. Fourth quarter equity performance was the worst since 2011. Positive returns for stocks in November were bracketed by months defined by swift selloffs as rising fears of peak earnings and slowing economic activity globally took hold of the market narrative. All told, domestic equity markets, as measured by the S&P 500 Index, dropped -13.5% during the quarter and -4.4% for the year. increasing the country’s consumption tax. Meanwhile, European stocks struggled as BREXIT concerns continue to weigh heavily on investor sentiment in the region.. Emerging markets, as measured by the MSCI Emerging Markets Index, held up best, -7.5%, but declined over -14.5% for the year. The Feds hiked the Federal Funds rate by 0.25% again during the period, but lessened their expectations surrounding future rate hikes in response to a deceleration of economic data and waning inflationary pressure. The yield on the benchmark 10-year Treasury fell sharply from 3.05% at the end of trading the previous quarter to 2.69% at quarter-end. Stocks are well positioned to outperform bonds in 2019 as valuations have declined to below average levels and interest rates remain below their long-term averages. Economic growth is poised to slow modestly, particularly among developed markets, but stable growth in emerging markets should support growth globally and there is minimal chance of a recession on the immediate horizon. To hear more about the market trends this quarter, watch Nicole’s interview with Darin, or listen to the audio version below.